NOTICE: Requires a registered license of GameMaker Studio 1 or 2. 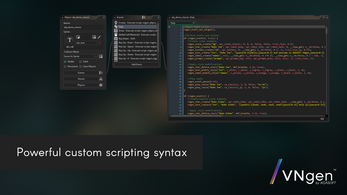 GMS 1 users must import macros from the included 'macros.txt' file before using VNgen. Easily create dynamic visual novel content and sequenced animations with VNgen by XGASOFT. 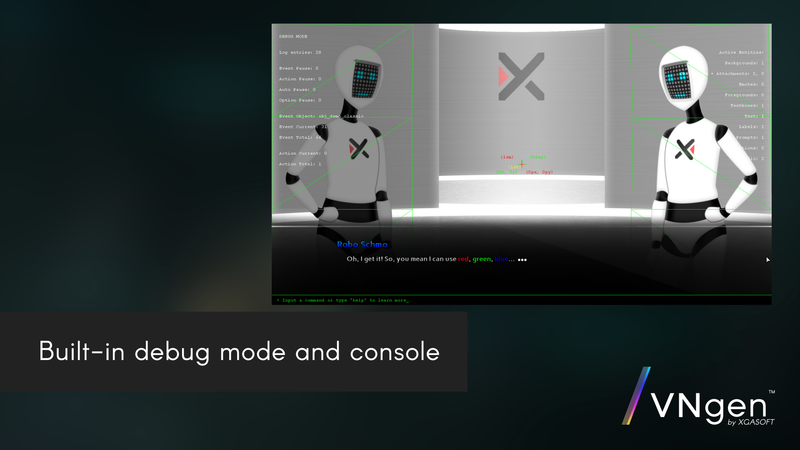 Powered by Quantum, VNgen uses a powerful scripting system within GameMaker Studio, breaking the limits of GML to deliver high-quality presentation both in the IDE and on target devices. A complete rewrite of the popular Edge VN, VNgen reimagines visual novel design from the ground up, providing access to advanced features previously only accessible to high-budget studios with custom engines. 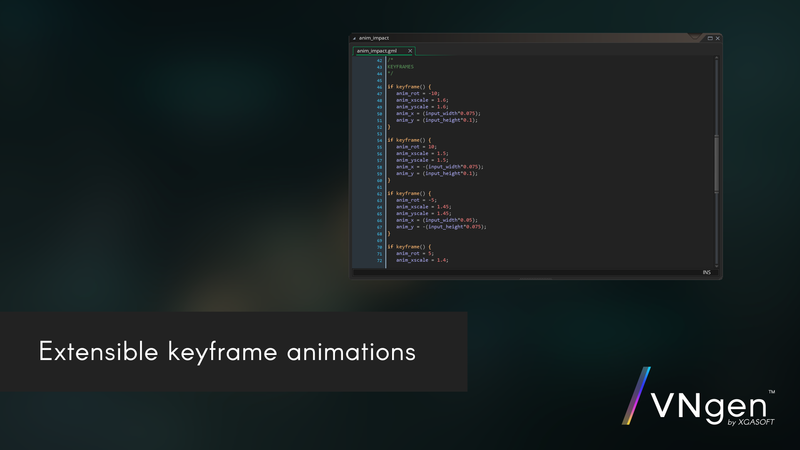 As a sequenced animation platform the possibilities are endless, offering a combination of built-in transitions and animations plus support for user-created animation scripts using simple keyframe logic. 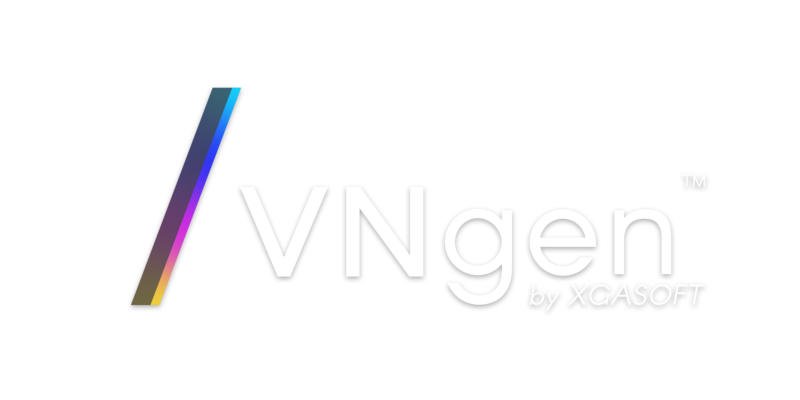 As a visual novel engine, VNgen supports virtually limitless entities of every kind, all part of a flexible, modular structure which can be customized to suit almost any user's needs. Just want something simple? Good news: VNgen handles the complex stuff so you don't have to. 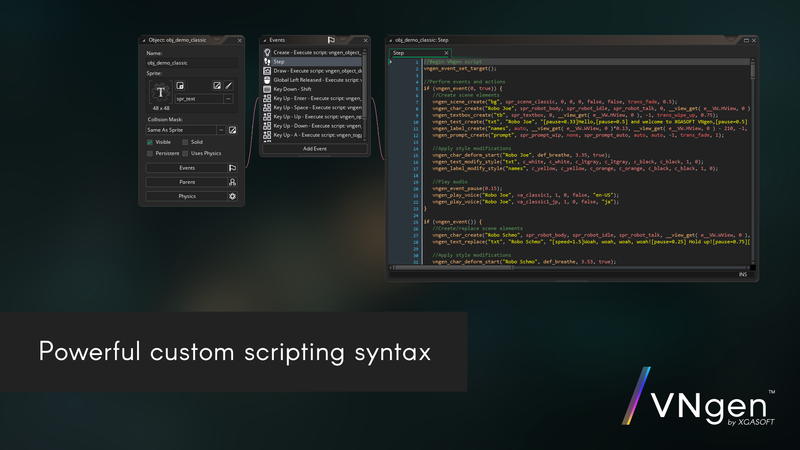 Many functions have both simplified and extended counterparts, offering something for every level of programming experience. Building a full game? Great! 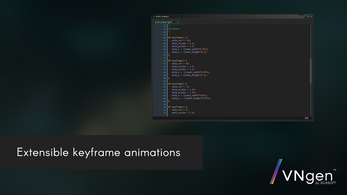 As an extension of GameMaker Studio, VNgen can be used entirely on its own or as a layer on top of your own custom code and game mechanics. 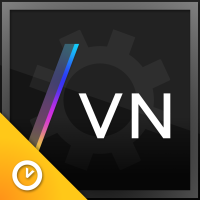 You can even integrate your own code into VNgen without modifying anything! 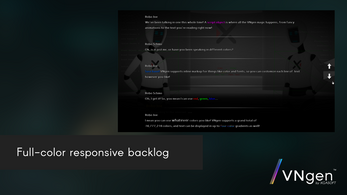 VNgen isn't just a visual novel engine--it's a completely new way to create content in GameMaker!